SEOUL -- Vietnam regards South Korea as a crucial trading partner as the Southeast Asian country accelerates reform and opening to join the global free trade order and becomes a strategically important place for foreign companies seeking to expand their presence in Southeast Asia, said a prominent Vietnamese businessman-politician said. The unanimous endorsement of the Comprehensive and Progressive Agreement for Trans-Pacific Partnership (CPTPP), a free trade agreement involving New Zealand and 10 other countries in the Pacific region, through Vietnam's parliament in November proved that Vietnam put great emphasis on "global convergence," Vietnam Chamber of Commerce and Industry (VCCI) Chairman Vu Tien Loc told a business form in Seoul. 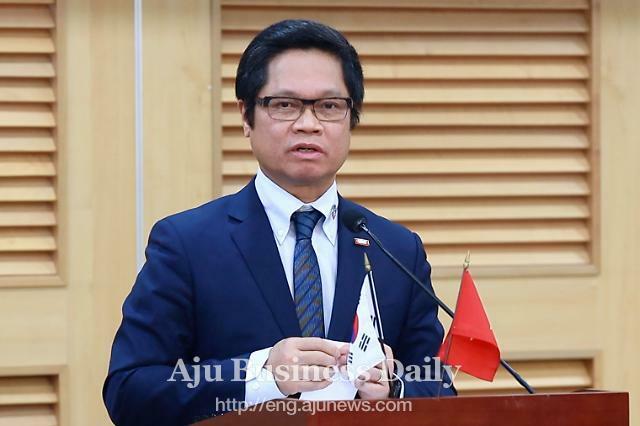 The Korea-Vietnam Business Forum marking the 26th anniversary of diplomatic ties was co-hosted by the Small Business Corporation (SBC), the Korea Vietnam Economic and Cultural Association (KOVECA) and Aju News Corporation. Vietnam signed a free trade agreement (FTA) and an investment protection accord with the European Union in October, becoming the second ASEAN (Association of Southeast Asian Nations) member to do so after Singapore. "These free trade agreements will bring very innovative results to Vietnam," Loc said through an interpreter, adding that Vietnam, which has trade relations with 200 countries and signed FTAs with more than 50 countries, is ready to interact with all other countries in the world while speeding up reform and opening. Vietnam is emerging as an important strategic base for investment in Southeast Asia amid the reorganization of an international order and a US-China trade war, Loc said, adding Vietnam holds the most important position in the "Indo-Pacific Strategy" of the United States. "I think that investment in Vietnam, which has become a strategic base, can be a shortcut to investing in ASEAN countries. Many U.S. and other foreign entrepreneurs doing business in China favor Vietnam as the most ideal place for relocation as shown in a survey of 1,000 company representatives, conducted by PricewaterhouseCoopers (PwC), a multinational consulting firm. The VCCI head said that the trend appears to be in line with South Korean President Moon Jae-in's "New South Policy" as Vietnam is ready to provide full support for investment by South Korean firms. For example, he said that a number of South Korean companies and state bodies such as KOTRA, a trade and investment promotion organization, are relocating their regional headquarters from Singapore to Vietnam. Loc called for the establishment of a joint trade center and a joint university, citing joint campuses set up by Germany, Japan, Australia and other countries. "Establishing a joint college is one of the projects I really want to push forward." At a summit in March, the two countries agreed to raise their bilateral trade to more than $100 billion by 2020, revealing Moon's strategy to reduce its heavy trade and economic reliance on China and the U.S. amid growing concerns about a trade war between Washington and Beijing. The summit sparked a flurry to business cooperation. Jay Y. Lee, the virtual head of South Korea's top conglomerate, Samsung, made a business trip to Vietnam in October, followed by Lotte Group chairman Shin Dong-bin in December. For its part, Vietnam has embraced an inflow of South Korean capital and culture. Well before Moon's trip to Vietnam, Southeast Asian nations have replaced China as an emerging place favored by South Korean investors. South Korean firms think Vietnam is luring foreign investors with an aggressive government policy of providing incentives to foreign investors. In 2017, Vietnam was South Korea's fourth-largest trading partner with bilateral trade reaching $63.9 billion. Experts credit Vietnam's rise to its growing prominence as a strategic outpost for big firms like as Samsung. According to data published by the Federation of Korean Industries (FKI) in November, Vietnam accounted for 17.7 percent of total direct overseas investment by South Korean companies in 2017.